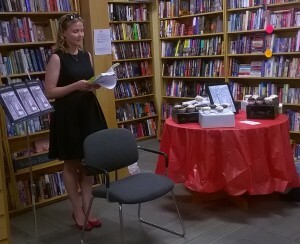 Cairn Press released my novel, A Teacher Named Faith, on July 31, 2015. 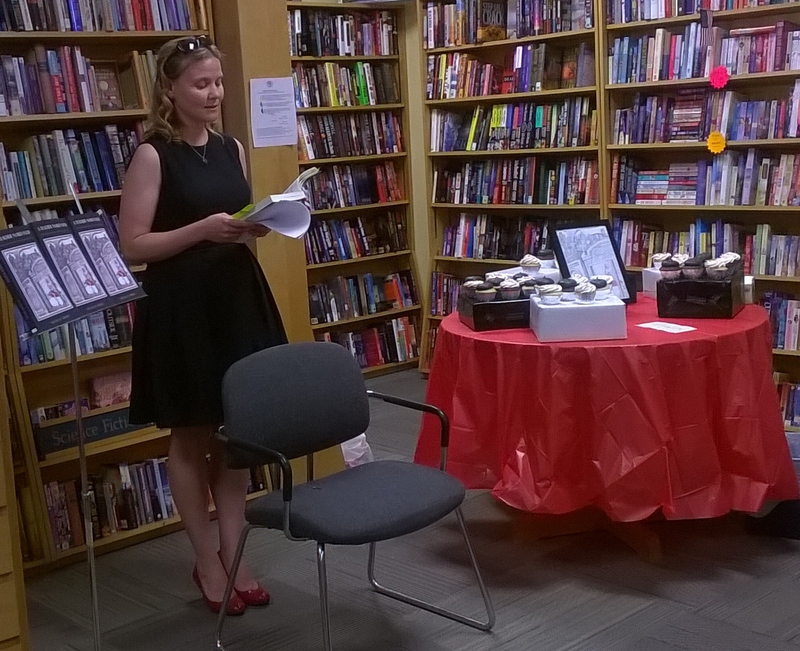 Battle Creek Books hosted the release event, which included a reading. The following is the introduction I prepared for that reading. Pictures provided by friends’ cellphones. Today, my first publish novel goes out into the world. I have dreamed of this since I was a child. 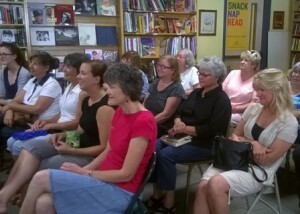 I imagined holding my book in a bookstore, reading to sea of interested faces. And now, at the tender age of 42, that book has a cover – this cover – and those faces are, well, your faces. So, thank you. You may not remember too much about this night, but I will never forget it. Most of you know me as a columnist. A few of you might know me as a playwright. And some of you might just be here for the free cupcakes, which is okay. A novel has a very different creative process than a column or a play. Basically, it was the most exhausting project I have ever undertaken, requiring years of my life and putting me to the test like no other project ever has. Well, outside of raising teenagers. It is been my beautiful burden, my favorite darling. That said, I do not hold an MFA. There will be no gorgeous metaphoric passages about the color of the sky and how it echoes the characters’ latent struggles with God. Well, that might be in there, but it will be about four words long. I’m not a wordsmith. I’m a columnist and playwright. My prose is short, to the point, and contains a lot of dialogue. I began this novel in 2007. A majority of it was written in Canada when my family lived there from 2010-12. Several amazing editors worked on this piece from 2012-2014. They made me do unspeakable things to the manuscript, things that tore my heart out, as well as 30,000 words. And they were right – every syllable, every time. I can stand here today and tell you this a good read, because of their red pens. God bless the gatekeepers. I wish the world had more of them. 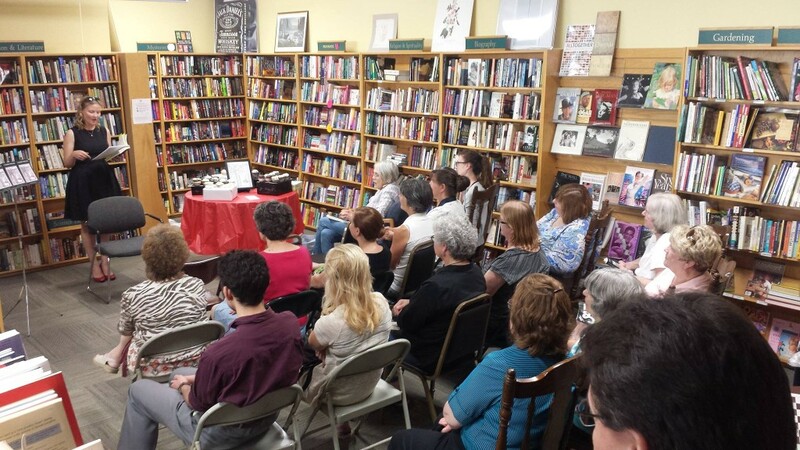 I’m supposed to introduce the book without giving away the plot. No problem. I don’t want to give away the plot. It’s a surprise. However, I already sold the book to my parents based completely on “Trust me.” And they were somewhat morally required to buy it from me. I doubt you nice people came here to hear that. Besides, if I just start reading you parts with no plot, we will all be confused. So, I am using a version of the official summary my publisher approved for the press release. Terrorists compromise a plane on the anniversary of 9/11 and it explodes over the city of Detroit. Political cartoonist Saul Thorn juxtaposes the image of a dance teacher against the city’s smoking skyline. That same day, a photojournalist takes a picture of Saul’s twin brother Simon praying in the panicked Detroit Metro Airport. The cartoon and the photograph receive national attention, casting Saul as a beacon of hope and Simon as a man of faith. The truth, however, is far more complicated. Saul, a hardened cynic, didn’t expect his best work to come from his tortured feelings over longtime girlfriend, Faith. Simon, a failed seminarian, was only in the airport because he left God to propose to an ex-girlfriend. Determined to control their lives, these brothers fight against what they love, never realizing only love could lead them home. Those are the plot’s foul lines. Everything I read tonight should fit between those lines. I can’t wait to introduce you to these characters. I hope they captivate you as they did me. A final note before we begin. Many writers, when they talk about writing, say if you are not afraid, you didn’t create art. If that’s true, this is a very artsy fartsy book because I am terrified. On the other hand, as a Christian, we are told to “be not afraid”. Sending a story into the world is a lot like sending your children into the world. You know they will be judged, they might be misunderstood, and they will probably suffer. They will also do things you could hardly imagine, things that would never happen if you were too afraid to let go. I think I did my job. I am standing here, being afraid and not afraid all at once.